1897-S Morgan Dollar Value is affected in part by the price of silver, but mostly their value is determined by their mintage (survival rate), their grade and condition. The mintage is how many were minted by the United States Mint and survival rate is how many 1897-S Morgan Dollars have survived over the years. Grade is how much wear the coin has sustained during its time in circulation, and grades are from Fair 1 through MS68, so a G4 (Good) 1897-S Morgan Dollar is worth at least $25 and one graded MS64 (Mint State) is worth around $200. An 1897-S Morgan Dollar graded value also depends on which grading service certified the coin with PCGS bringing top value and NGC, ANACS and ICG following in that order. Any other grading service holder is usually considered a raw coin by serious coin collectors and the experts. Collectors should be warned about counterfeits and fakes because they’re numerous and some are dates and mints that never existed; while others can be housed in fake grading holders. You can learn more about fake and counterfeit Morgan Dollars HERE. 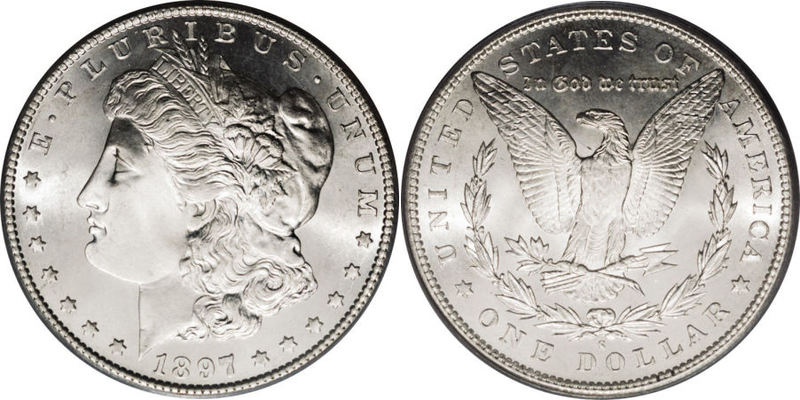 Note: This George T. Morgan creation has become America’s most collected, famous, and abundant silver dollar. Coupled with the coin’s size, silver content, beautiful design and high mintages it’s no wonder it’s coin collectors most favorite coin. 1882-O MORGAN DOLLAR - ALMOST UNCIRCULATED - FAST SHIPPING - FAST COIN DELIVERY! 1921 Morgan Dollar MS63 NGC Super Nice Toned Coin ! 1885 MORGAN DOLLAR - ALMOST UNCIRCULATED - FAST SHIPPING - FAST COIN DELIVERY!